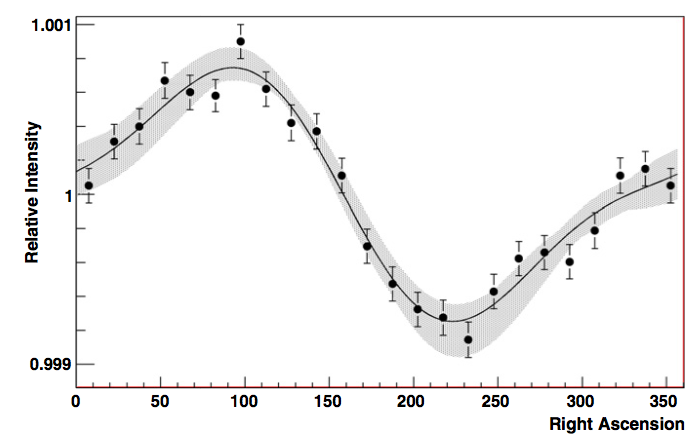 Cosmic rays below the knee (~106 GeV) are mostly believed to be originated in our Galaxy. The current model is that galactic cosmic rays are generated in supernova explosions and accelerated by shock acceleration mechanisms in supernova remnants. Galactic cosmic rays are also believed to dominate the spectrum above the knee and up to about 109-1010 GeV, where the transition to extra-galactic cosmic rays is believed to occur. If 1-10% of the galactic supernovae energy is released into cosmic ray energy, then the observed galactic cosmic ray density can be sustained. Therefore the observed galactic cosmic rays are thought to be emitted by all supernova explosions in the galactic disk over its history, and they are assumed to be sufficiently scrambled by the galactic magnetic field. Although cosmic rays are expected to be isotropic in their arrival direction, a small anisotropy (about 10-4) was observed by various experiments in the northern hemisphere from a few tens of GeV to a few hundreds of TeV. The IceCube Observatory records several tens of millions of cosmic ray induced muon events each day. This is the background in the search for high energy neutrinos, but their arrival direction and energy is related to the parent cosmic rays. Therefore these events can be used to probe the properties of their parent cosmic rays. In particular the high statistics of the collected events allows IceCube to precisely measure the anisotropy in arrival direction of cosmic rays with median energy of about 20 TeV (i.e. well below the knee). The IceCube map shown above was determined using the data collecetd by IceCube-22 string configuration. The data were collected from June 2007 to March 2008 (226 livetime days), and they consist of 4.3•109 events with a median cosmic ray energy of about 20 TeV. The median angular resolution of the cosmic muon events is about 3° (not to be confused with the angular resulution IceCube can reach in the reconstruction of neutrino-induced events). The relative intensity map is constructed by independently normalizing each 3° declination band to unity, and by determining the relative deviation of events in a bin of the declination band with respect to what it would be if cosmic rays were isotropic within the band. The origin of the anisotropy in arrival direction of the cosmic rays is still unknown. From the study of the energy dependence of the anisotropy, as well as its angular scale structure and time dependence, it seems that multiple causes might contribute to the observation, making it challenging to disentangle the various effects. It has been argued for a long time that we might observe the so-called Compton-Getting Effect (Compton A.H. & Getting I.A., Phys. Rev. 47, 817, 1935) : an apparent energy-independent dipole modulation due to the relative motion of the Solar System through the Interstellar Medium as a consequence of the orbital motion around the galactic center. The motion of the Solar System in the galactic rotation is about 220 km/s, which would produce an excess of cosmic ray intensity toward the direction of motion (α = 315°, δ = +48°) with amplitude 0.35%. 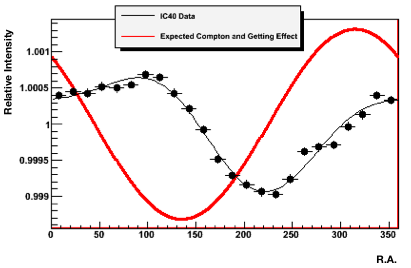 The figure on the left (Craig Price) shows how the modulation caused by the Compton-Getting Effect would look like in IceCube, compared to the sidereal anisotropy modulation in right ascension. It is evident that not only the expected amplitude is bigger than the observed one, but the phase of the modulation does not agree with the observation. The Compton-Getting effect relies on the assumption that, in the motion of the Solar System dragged in the galactic rotation, cosmic rays rest frame is independent (i.e. they do not co-rotate with the Galaxy). This is unlikely, nevertheless the rest frame of cosmic rays is not known and it might be a function of their energy (their galactic confinement changes with cosmic rays energy). Even a residual relative motion of the cosmic rays reference system with respect to the Solar System, might have a different direction. Therefore we conclude that the Compton-Getting effect might be a small component of the observed anisotropy, even if it is unknown what this would be in reality. What is observable is a similar effect due to the motion of the Earth around the Sun (with a speed of 29 km/s). Since this motion is in a much smaller scale, the local rest frame of the cosmic rays is well defined by the Sun. 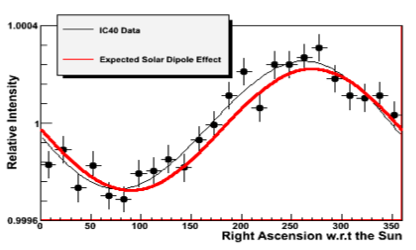 A dipole modulation is visible as a relative excess of the cosmic rays intensity toward the direction of Earth's revolution motion, and a deficit on the opposite direction. The figure above (Craig Price) shows how the modulation of cosmic rays arrival direction (in a rest frame fixed with respect to the Sun, i.e. using the right ascension from the Sun) perfectly matches the expectation. In the used reference system 0° corresponds to the location of the Sun, and 270° to the direction of Earth's motion around the Sun. The heliosphere is likely to affect sub-TeV cosmic rays, since its size (~ 100-200 AU) is about the gyro-radius of a TeV proton in a 3μG magnetic field. On the other hand the uncdertainty on the heliospheric width in the heliotail region (~ 600 AU) and the unknown length of the heliotail (up to ~ 10,000-20,000 AU), adds strong uncertainties in the role that the heliosphere might have in generating the observed anisotropy up to the multi-TeV energy range. It is possible that the correlation of energy and angular scale of the anisotropy might provide a hint on the distance scale of the cause, we might be able to determine. Small scale modulation migth be associated to relative local effects, depending on the energy of the cosmic rays. While the furter the cause, the larger the modulation would be, due to the londer diffusion time through the interstelalr matter. Since cosmic rays below the knee (~ 3•103 TeV) have a gyro-radius smaller than 0.4 pc in a 3 μG magnetic field, we can also argue that the properties of interstellar magnetic field within this distance scale has an important role. Unfortunately, while we are learning a great deal of what the local interstellar magnetic field just outside the heliosphere might be, we still don't know much about the magnetic field at larger scale (only that it tends to be parallel to the galactic planes at enough large scale). The properties of cosmic ray propagation in the local interstellar medium is highly uncertain because we don't know much about matter density and magnetic field turbulende scale. If the galactic cosmic ray anisotropy persists up to a few hundreds TeV (whose evidence is still challenged) then its origin would span a very large volume around the Solar System. There is also the possibility that even cosmic rays propagating a few hundreds pc might still have a general directionality, depending on the properties of cosmic ray propagation through interstellar medium. The possibility that a single or a small number of young (~10,000-100,000 years) and nearby (~ 100-1,000 pc) supernovae might have produced a cosmic ray blast that is stochastically anisotropic over the istropicic intensity of older cosmic rays is very suggestive and provides the possibility that the origin of cosmic rays might be discovedered through the study of their anisotropy. This might explain the large scale anisotropy up to a few hundreds TeV in cosmic ray energy. If this is true the energy spectrum of the younger cosmic rays from the relative intensity excess should be different from the average flux.